This shop has been compensated by Collective Bias, Inc. and its advertiser. All opinions are mine alone. #thetalkofthetable #CollectiveBias The following content is intended for readers who are 21 or older. It’s time for some creamy garlic mushroom chicken. Fall is the time for comfort food in our house. We love rich and wholesome dishes that are hearty and earthy at this time of the year. And what could fit the bill better than this Creamy Garlic Mushroom Chicken recipe? It ticks all the boxes for comfort food and tastes delicious, too. And even better? It is one of my 30 minute meals! One pot meals are a favorite choice at my house. My family loves the great taste and I love the easy clean up. Be sure to check out my one pot cooking tips here for success with one pan cooking every time. For another great tasting 30 minute meal, try my beef and penne pasta recipe. It tastes amazing! It’s time to make the Creamy Garlic Mushroom Chicken. This Creamy Garlic Mushroom Chicken is so, so tasty and is ready in a flash. Most of it comes together in one pan and it’s on the table in less than 30 minutes. A win-win any day of the week for me! 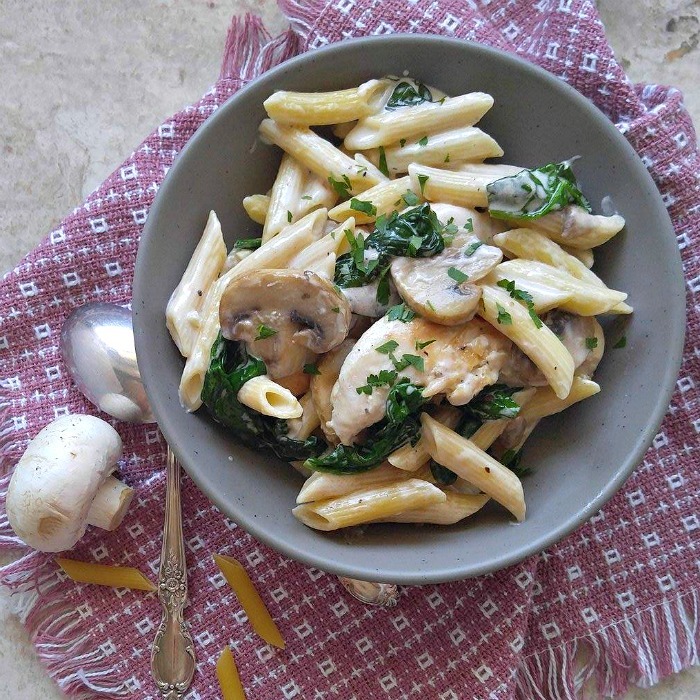 Look at the wholesome ingredients that go in this Creamy Garlic Mushroom Chicken dish. 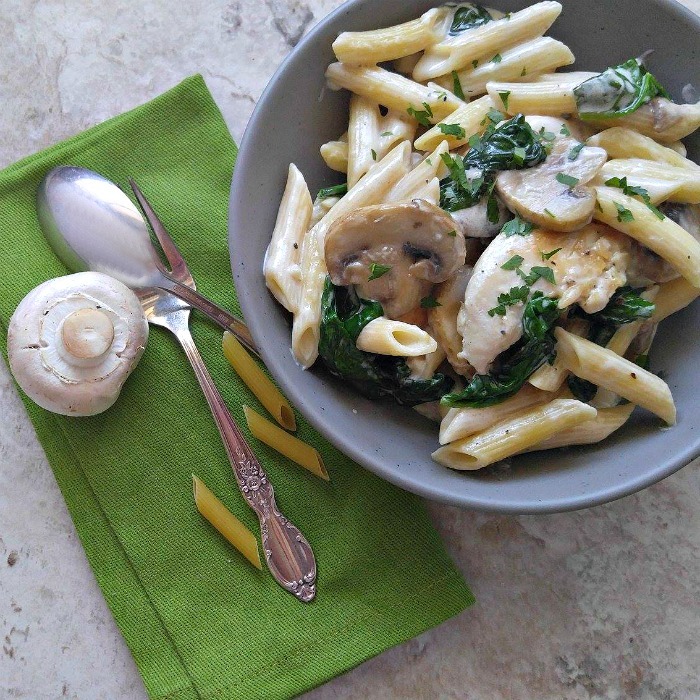 I use Barilla Penne Pasta, boneless chicken breasts, fresh white mushrooms and fresh Parmesan cheese along with heavy cream, baby spinach leaves and a few other seasonings to make a melt in your mouth dish that is just perfect for the cooler fall temperatures. I especially love using Barilla Pasta. It is the #1 choice of Italy. How can you go wrong? Did you know that fall and the holiday period are two of the largest consumption periods for pasta and wine? 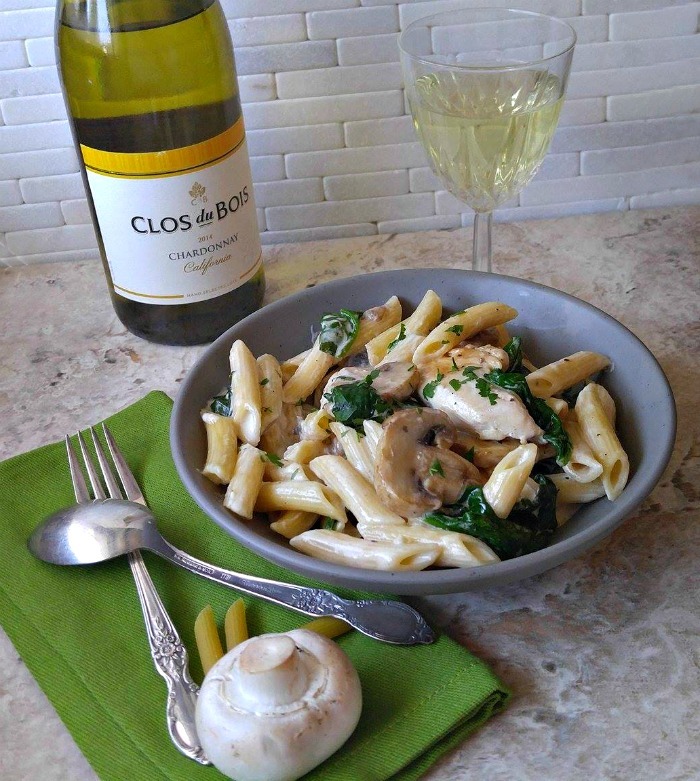 Since we also love to pair great tasting recipes with a great tasting wine, at my house, Clos du Bois Chardonnay is my choice to pair with this delicious dish. The wine is bright, refreshing, and fruity with a balanced oak character. 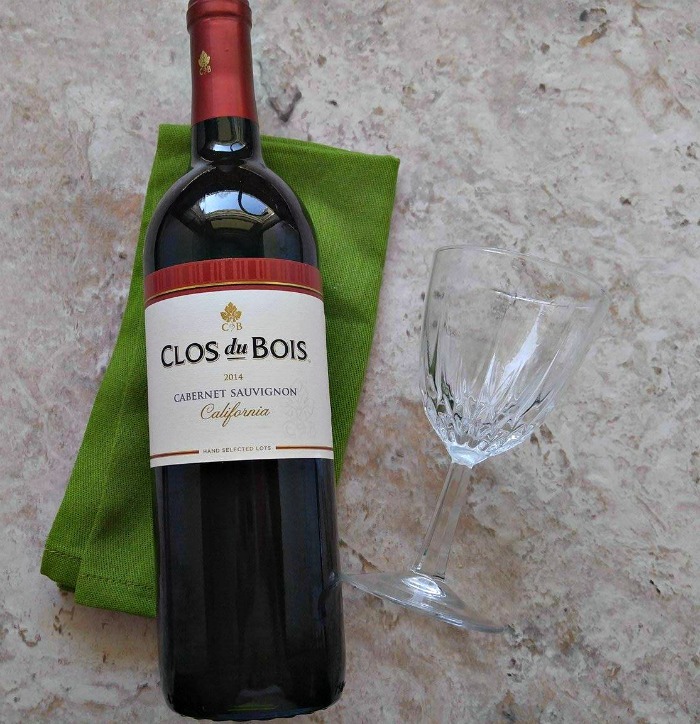 Clos du Bois wines are the perfect entertaining solutions, no matter what your special occasion is. 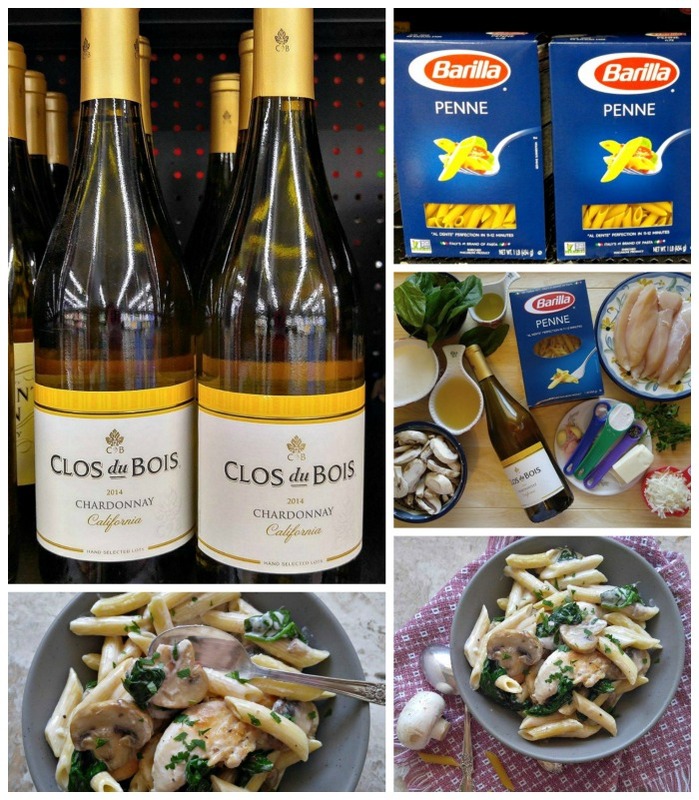 Whether it is a simple meal with friends, a pot luck holiday meal, or an elegant entertaining occasion, Barilla pasta and Clos du Bois wines are certain to delight your guest and make the occasion very special. This recipe is so easy to make. I started by putting my Barilla Penne Pasta on to cook and then browned the chicken and mushrooms in a non stick skillet. By this time the pasta was cooked, so I added it to the skillet along with the spinach and allowed it to wilt. Then in go those earthy mushrooms! 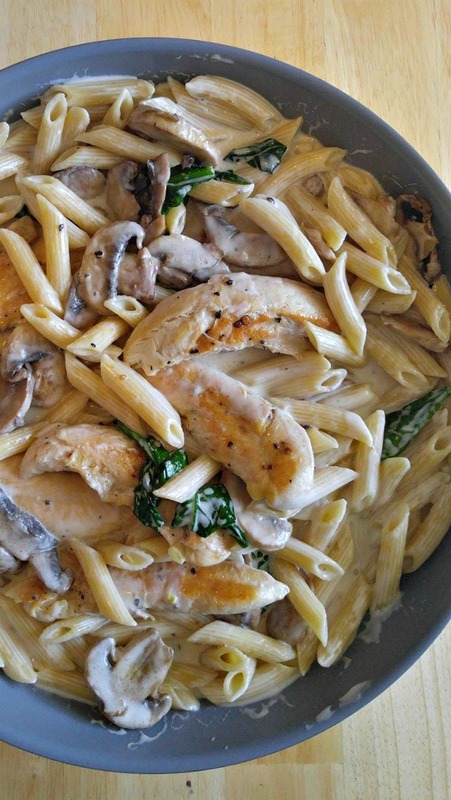 Can you believe this Creamy Garlic Mushroom Chicken is almost done? All that was left to do was return the chicken to the skillet and stir everything so that all the flavors would mix well. The flavor of this Creamy Garlic Mushroom Chicken is amazing. It is rich, creamy and cheesy with the hearty flavor of mushrooms. The chicken is so tender and the sauce compliments the pasta beautifully. Each bite of this amazing Creamy Garlic Mushroom Chicken will delight. Serve it with a simple side salad or some fresh home made garlic bread and get ready for the compliments! The Clos du Bois Chardonnay that I used in the recipe ingredients makes the perfect wine to pair with it. Good food, Good wine, Good friends. The recipe for a perfect evening! Viva Italia! The Clos du Bois Chardonnay pairs so beautifully with this dish, that I decided to also pick up a Clos du Bois Cabernet Sauvignon on my shopping trip to pair with beef sometime next week. Yay for food and wine pairings! Clos du Bois wines are sure to please. They use the French way of making wine with the benefit of the California sun. Since my daughter lives in California, it’s always a delight to serve one of these wines. Each vintage is well balanced and true to the varietal character. They are elegant wines at an unbelievable value. A great wine every time! 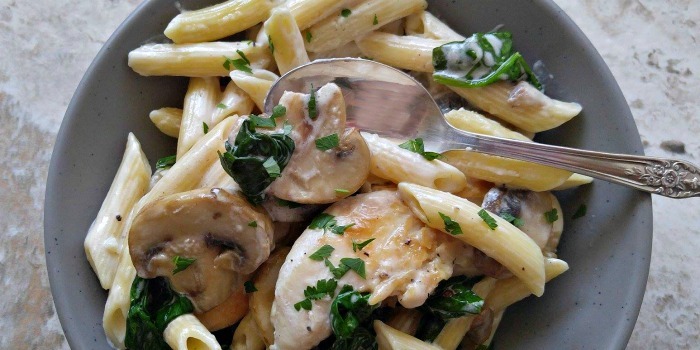 Ready to make this delicious Creamy Garlic Mushroom Chicken for your friends and family? Gather up your ingredients and get ready to spend just 30 minutes in the kitchen. You’ll end up with a great meal and the wine will make the dinner a very special occasion! Looking for more great pasta recipes? Be sure to visit Barilla’s Social Hub, as well as the Talk of the Table page, and get inspired. 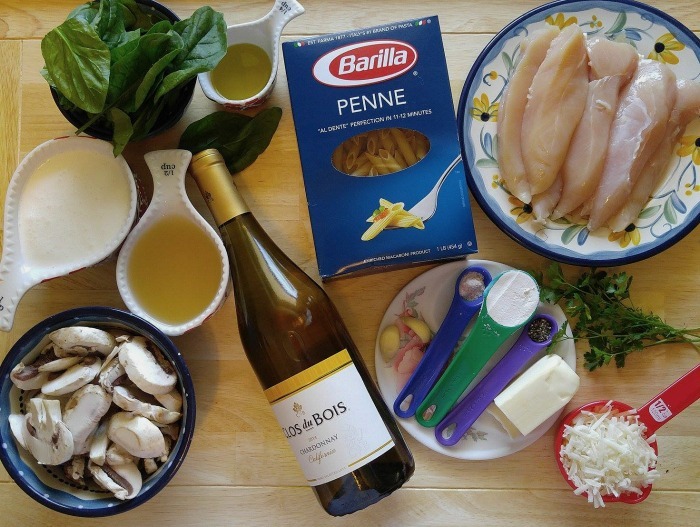 And head to Barilla on Pinterest and Twitter for more great ideas, too. Are you fond of pairing food and wine during the holidays only, or is this something you like to do all year long, like I do? I’d love to hear your thoughts in the comments below! Place the Barilla Penne pasta in boiling water and cook according to package directions. Drain. Season the chicken tenders with salt and pepper. In a large non stick frying pan, add 1 tbsp of the olive oil, and cook the chicken over medium heat for 3-5 minutes on each side or until it is browned on each side and no longer pink in center. Remove the chicken and set aside. Add the remainder of the olive oil and the sliced mushrooms and cook for a few minutes until tender. Remove and set aside with the chicken. To make the sauce add the butter and melt. Stir in the minced garlic and cook until translucent. Whisk in the flour until it makes a roux. 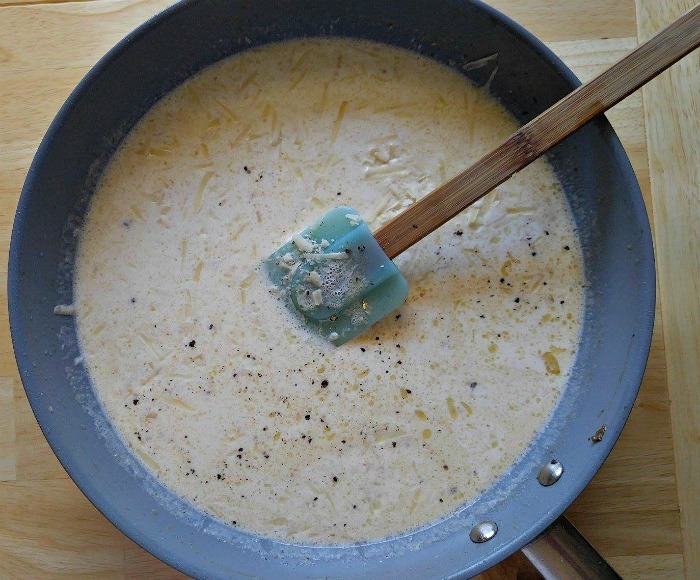 Whisk in chicken broth, wine, heavy cream, Parmesan cheese, pepper and sea salt. Stir in the cooked Barilla Penne Pasta and combine well. Add the spinach and let simmer until it starts to wilt. Add the cooked mushrooms and combine well. Put the cooked chicken tenders back into the pan with the sauce and coat evenly. Serve immediately, garnished with fresh parsley. This recipe pairs well with the remainder of the Clos du Bois Chardonnay. that looks amazing, have pinned for later!